Colston Bassett Stilton for sale. Buy online at Zingerman's Mail Order. Gourmet Gifts. Food Gifts. The creamiest of the British blues. Creaminess is the hallmark of great Stilton cheese. 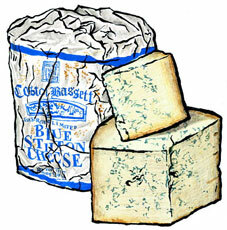 And Colston Bassett Stilton is the creamiest of British Stiltons—one of the world’s great blue cheeses. These wheels of Colston Bassett were selected just for us by England's great cheese exporter, Neal’s Yard Dairy. The selection ensures we're getting cheese that arrives full flavored and creamy, never spending months—or even weeks—in a warehouse. Paired with a glass of ruby port, it’s the perfect ending to a memorable meal, or the prelude to a special gathering of friends and family. Our current wheel of Stilton has earthy, deep notes that remind me of dark chocolate balanced with bright blue notes.